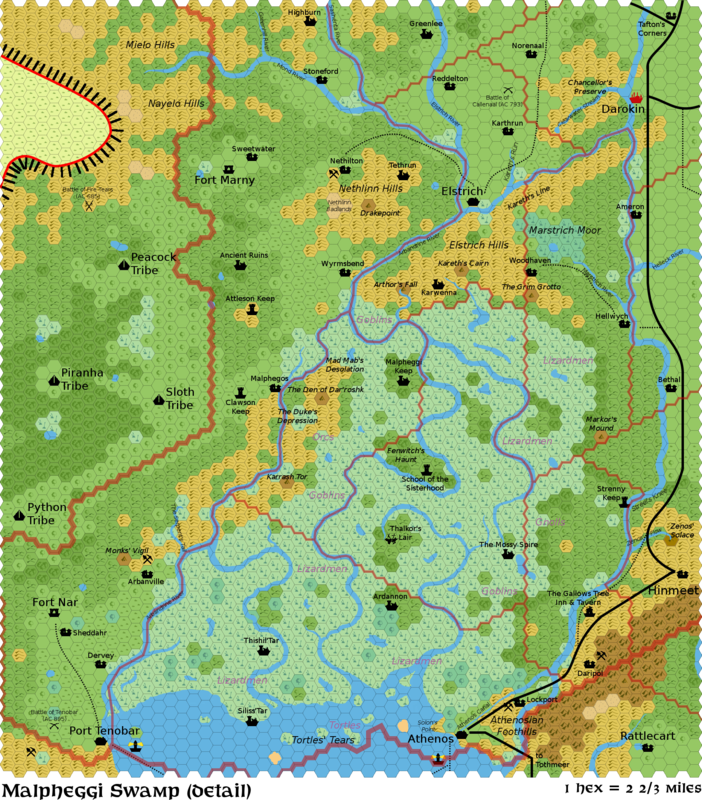 In the vein of mapping around Threshold, I've created a detailed 2 2/3 miles per hex map of Darokin's Malpheggi Swamp.. Thanks to: Thorfinn Tait (for all his awesome maps and general inspiration), Isomage (hexgimp), the authors of malph.jpg and the other sourced materials from the Vaults of Pandius, and the kind and helpful comments in this thread and on this board. Ameron: A small farming and fishing community, due to its location a day's travel south of Darokin Ameron has grown into a regular stop for many traveling merchants. Although it has no formal trading location, the largest inn has seen many, many deals brokered. Ameron is well protected from the humanoids by the river, and is far enough from the swamps to generally be safe. However, every once in a great while an adventurous splinter group of humanoids (often lizardmen) will take up residence in the bogs just across the river. They are usually quickly dispatched. Arbanville: (from Atruaghin Clans and Darokin) This is a small mining and farming village. Of particular note among the inhabitants is a group of expatriate Averoignese. Daripol: Once upon a time, this was known as Dariopolis (the City of Darius), a particularly grand name for what has never been much more than a small mining encampment. Curiously, though, there has been a Daripol here for nearly as long as there has been an Athenos on the bay. Dervey: (from The Sisterhood of the Fens) A tiny village north of Port Tenobar. Known to have an Herbwoman named Mirelle. Former home of a Fenwitch, Ursalla. Hellwych: (name from The Map of the Westerlands): This village serves as the warehouse for Woodhaven's lumber (and has a few lumber camps of its own in the hills to the west). The wood is usually shipped downriver to Athenos for shipbuilding, or north to Darokin for construction. The village's primary focus is farming, though, with fields spreading miles to the east, across the river. It has a decent inn for travelers, as it sees a lot of river traffic between Darokin and Athenos. Karthrun: This is a small farming village, of no particular note except that it is near where a seasonal stream (Kareth's Run) normally starts during heavier rains. The name is taken from the river's name, but the reason for the name has long since been lost to history. Lockport: This small town is a mix of a small, active mining community, and a larger town servicing the entrance to the canal (being the site of the first lock). Given the traffic on the canal, its function as canal labor overshadows the production from its mines. A common name used in the town is "Jeros Hawlen", the merchant (and amateur engineer) who first began agitating for the construction of the canal, e.g. Jeros' Watering Hole (a tavern), Hawlen's Haberdasher (a hat shop), etc. Malphegos: (name from The Map of the Westerlands) This is a small farming village. The inhabitants face a hard existance, between the Children of the Tiger to the west and the humanoids of the swamp to the east. They work closely with the garrison at Clawson Keep, and have a solid relationship with the soldiers there, grateful for the protection offered. Nethilton: Nethlinn Town when first founded among the hills, but early cartographers interpreted the somewhat relaxed pronunciation by local miners unwindingafter a long day, and this has since become the official name. Norenaal: A small farming community, sometimes visited by the medium-to-do of Darokin seeking insight into the former duchy's history. The inhabitants still occasionally tell the tale of the nearby Battle of Callenaal here, and recall as well the founding of several villages (including theirs) at the same time. In more wistful moments, those with particularly strong local pride exhibit some regret that it was not their village which served as the site of the historic battle (ignoring the detail that Callenaal is no longer standing). Reddelton: A small farming village founded well after the fall of Irum. It has a famous local tavern: The Red Duke's Tap, notable primarily for their "blood wine", Reddelton Red (made in vineyards not too far to the north, and colored to be a deeper red), and for the Duke's Last Meal, a house specialty. Once a year, they have a festival (a la Halloween) "celebrating" that bogeyman, dressing up in outrageous costumes and trying to scare each other. Sheddahr: This farming village is a gathering spot for all the outlying farms protected by (and providing food for) Fort Nar. It is a lively place, far enough from the swamps to be relatively safe, but still watchful for incursions from the Children of the Tiger. The excess production from this region is generally shipped to Port Tenobar. Sheddahr is home to a monastic order, monks known for their cheese production. Sheddahr cheese is renowned throughout the region. Stoneford: This small farming village is old and relatively unremarkable, but it has the potential to become a regional center once the trade paths to the Atruaghin Clans are completed. As the nearest non-homestead with easy access, the villagers could very well attract quite a bit of additional traffic in the near future. Sweetwater: (from The AC1017 Almanac) This village near Fort Marny is known for its cattle ranching, and is one of the primary suppliers for the Fort. It enjoys a close relationship with the the residents of the fort. The name comes from a particularly fresh spring near the town. Tafton's Corners (viewtopic.php?p=29301#p29301): This village sits at a major crossroads, and is named after an obscure general who fought a battle of some sort "years and years back". The nature of the fight (putting down a rebellion, defending against an orc attack, or making a defiant last stand) varies from villager to villager. Woodhaven: (name from The Map of the Westerlands) This village exports lumber from the woods nearby, but is otherwise self-sufficient from hunting and some farming. The inhabitants rarely deal with outsiders, except when shipping wood, and many came here to get away from more populated areas. Wyrmsbend: (name from The Map of the Westerlands) This small farming village is protected by and provides for the garrison at Fort Attleson. The name comes from a sighting of Thalkor near the river's bend when some of the earliest farmers were first tilling their fields. Attleson Keep: (name from The Map of the Westerlands) Established after the Great Merger (and like much of Darokin's military, using the Attleson name), this keep extends the Darokin border west of the Arbandrine by forming a line (along with Clawson Keep, Fort Marny, and Fort Nar) to decrease incursions from the Children of the Tiger. It will also serve to protect villages which may eventually spring up in the grasslands to its east. Clawson Keep: (name from The Map of the Westerlands) This small keep and its garrison helps preserve the western border, and provides immediate protection to the village of Malphegos (and other farms and homesteads in the area). Strenny Keep: Once, Streel's Knee Keep, but it became shortened with familiarity and the passing of hands. This outpost primarily serves to watch the humanoids of the swamp and curtail their forays into Darokin. School of the Sisterhood: This partially ruined tower is the centre of the Fenwitches' instruction (when not travelling the swamp to learn the local flora, fauna, and tribes). Like the rest of Fenwitch's Haunt, it is disguised, and an interloper will likely see nothing more than ruins -- if he isn't turned around by the confusion spells woven into the area. Andelham: (mentioned in The Sisterhood of the Fens) could be in the swamp patch northeast of Malphegos. It is unmarked on the map as the village was swallowed by the swamp. Ardannon: (from The Expanded Darokin Timeline) A city of black stone and ancient evil, it was torn down and cast into the swamp more than a millenium ago. Although long since forgotten, the evil within will almost certainly awaken again some day. Arthor's Fall: A name of (Molharran) antiquity, the tale has long since been lost. The Den of Dar'roshk: This cave complex houses a fearsome humanoid (goblin, hobgoblin, orc, or ogre chieftain of some sort). Drakepoint: (name from The Map of the Westerlands) This solitary peak may have once been home to a dragon (or might still be). Greenlee: (suggested by Winnower (The Beast Blade), inspired by BigHara's module Greenlee) This is the site of the last stand of Duke Rudgard, the Red Duke of Irum. The Grim Grotto: This dank cave, southwest of Woodhaven, is rumored to be the site of buried treasure -- and is known to have been the end of many treasure seekers seeking it. Highburn: Ruins of a town or village destroyed when Irum was beaten. Kareth's Cairn: This formation is taller than the surrounding hills and looks much like a giant's cairn might. Given its proximity to other things named for the long-forgotten Kareth, it has come to be known as Kareth's Cairn (despite no actual link to Kareth). Karrash Tor: This is a rocky peak. The name currently has no history. Karwenna: Molharran ruins of unknown history. Malpheggi Keep: This once marked the northern border of the Duchy of Malpheggi, but has since fallen into ruin. Monks' Vigil: The monks from the monastery near the village of Sheddahr use this outcropping for some of their ceremonies. The Mossy Spire: Ancient ruins of unknown origin, they now appear to be a very overgrown keep or tower. In all likelihood, this is left over from Taymoran times, and so the architecture should be very unusual. Thalkor's Lair: This is actually a large, petrified ship built by a forgotten race of giants and now stranded in the middle of hills near the center of the swamp. Deep in the bowels of this strange vessel lives the great black dragon Thalkor, ruler of the draconic kingdom of Thalkoria (Who�s Who Among Dragons). Zenos' Solace: Name of unknown origin (although Zenos is a Meruvari name), but it is said the view from the top of this solitary peak is breathtaking. Chancellor's Preserve: This lush valley in the hills near Darokin is used as a hunting preserve by the Chancellor and those he favors. It has variously been used as a vacation spot, a place to entertain visiting dignitaries, and a reward to friends, allies, and heads of major merchant concerns. The Duke's Depression: This is a swampy valley in the middle of a range of hills. Despite the catchy name and local legend that this is where the Duke of Malpheggi lost his final battle (and his life), it is none of the above. The name was bestowed one evening as someone was weaving tales around the campfire in nearby Malphegos. Fenwitch's Haunt: (extension of the ideas in The Sisterhood of the Fens) These forested hills near the center of the swamp are the center of the Sisterhood of the Fen's realm. They do not appreciate being disturbed and have cloaked the region with sufficient magics that they are difficult to spot, even when one is standing in their midst. The Gallows Tree Inn & Tavern (from Inns and Taverns in Mystara): This is a small, ramshackle building in desperate need of paint and care. The owner, Penard, considers this his retirement plan, and does little work, relying on the hired hands he browbeats incessantly. Plenty more detail in the original source material. Mad Mab's Desolation (from The Sisterhood of the Fens): This corner of the swamp was devastated by this Fenwitch destroying the creature she summoned in a fit of rage. Kurag's Sword (Kurag-ka) -- Led by Kurag Greatsword (who wields an impressive blade), this clan preys on the river traffic between the Gallows Inn and Lockport. So far, despite several attempts to eliminate them, Kurag has continued to attract goblins to his side. Should he fail in a raid, however, his followers would likely desert him. Sisterhood of the Fens: This group of witches has provided the inspiration for several details on the map, and they are detailed at the Vaults of Pandius. Elstrich/Nethilton/Nethlinn Hills: Across the hills, south of Nethilton's mines, is a particularly rocky area. Sometimes called the Nethlinn Badlands by the locals, or even the Nethlinn Wastelands, reportedly it was harsh enough of an environment that when some of the last inhabitants of doomed Nethlinn fled, the Duke of Irum's forces did not pursue. Now, something horrible stirs among the rocks, and villagers in Nethilton have begun disappearing, with some indications that whatever caused this fled into the wastelands. Lockport: It's the end of a period of very heavy traffic on the canal, and the nearby mines were shutdown briefly while the miners worked as canal labor to ease the crunch. When they returned to the mines, humanoids from the nearby swamps have taken over, in a bid to find a better base for raiding the barges on the canal. Siliss'Tar: A renowned archaeologist, investigating the history of the swamp, has heard from fishermen that stones have recently been uncovered by the normal work of the ocean, and he wants to mount an expedition into the dangerous swamp to investigate. This could include dealing with the inhabitants of the swamp, the nearest tribes (who might well see the new ruins as a better place to live), and anything which might be left over in the ruins from the time of the Lizardman empire of millennia past. Strenny Keep: One of the lizardman tribes has recently tamed a basilisk, at great cost to themselves. The tribe has since splintered into the original tribe who want nothing to do with the pet and the new Stonegaze (Shil'srathaz) tribe which uses the basilisk as its mascot and weapon. With this newfound weapon, they're driving the nearest gnoll clan out of their claimed territory, increasing the attacks around the keep. If the party is nearby or otherwise associated with the Darokin army, they may be tasked to find out what caused the sudden increase in activity, and possibly may need to help defend the keep against a small lizardman army with one or more basilisks in tow. Although I don't view the frontier as close to Last of the Mohicans as the Westerlands Campaign does, I should note that the border with the Atruaghin Clans is probably not settled. It's simply the territory that Darokin is comfortable laying claim to. So, for instance, the mine west of Tenobar is probably sometimes held by Darokin, and sometimes not. (I wouldn't be surprised if it falls outside Darokin's claim due to the nearby Battle of Tenobar, depending on how one wants to define its outcome.) This area is the most likely area in the region for a party of adventurers to be given as a domain to tame.